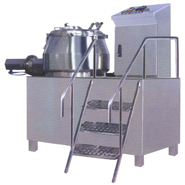 Rapid Mixer and Wet Granulator are used to perform dry mixing and wet granulation at same time in the same bowl. There are two impellers inside the RMG bowl. 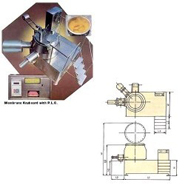 Main impeller runs in horizontal plane and chopper /granulation impeller runs in vertical plane. RMG produces a highly efficient, fast & gives superior results in homogenous mixing & granulation of material All process contact parts like bowl, chopper etc.,are in AISI SS 316, with high pharmaceutical finish & other non contact parts like staircase / railings are in AISI SS 304. The process is fully dust free and automated with the help of PLC including its Discharge etc. Built in cleaning system for both shaft seals . MODEL Useful Volume Gear Box Ratio Main Motor HP (1500/750RPM) Chopper Motor HP(1500/3000 RPM) Discharge ht.